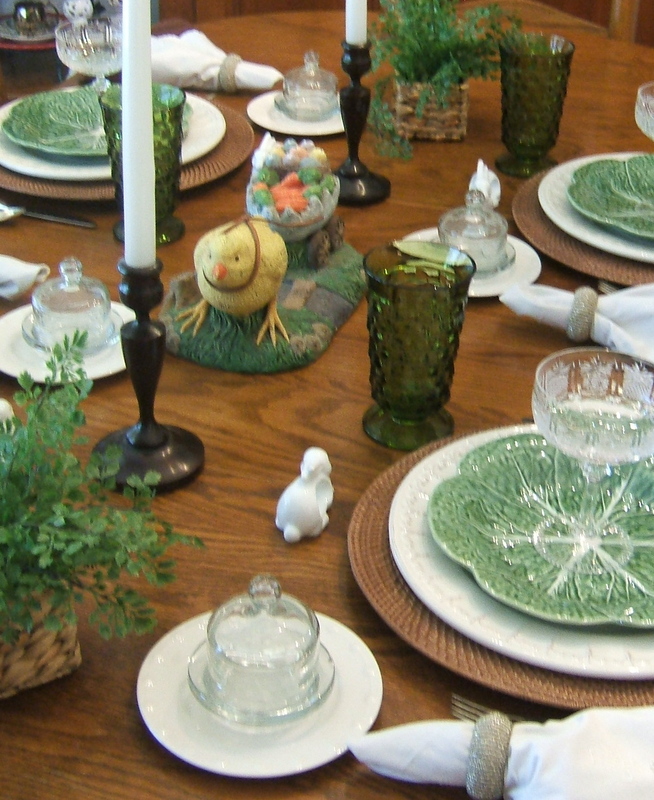 Today’s tablescape features my favorite little chick pulling his half shell-wagon of eggs. While this piece is not vintage, I absolutely love that it looks vintage. I found this darling in a little shop in the charming town of Salem, Virginia. The chick is surrounded by antique wooden candlesticks which were a wedding present oh so many years ago. Rounding out the table center are little baskets of greenery found recently at a yard sale. 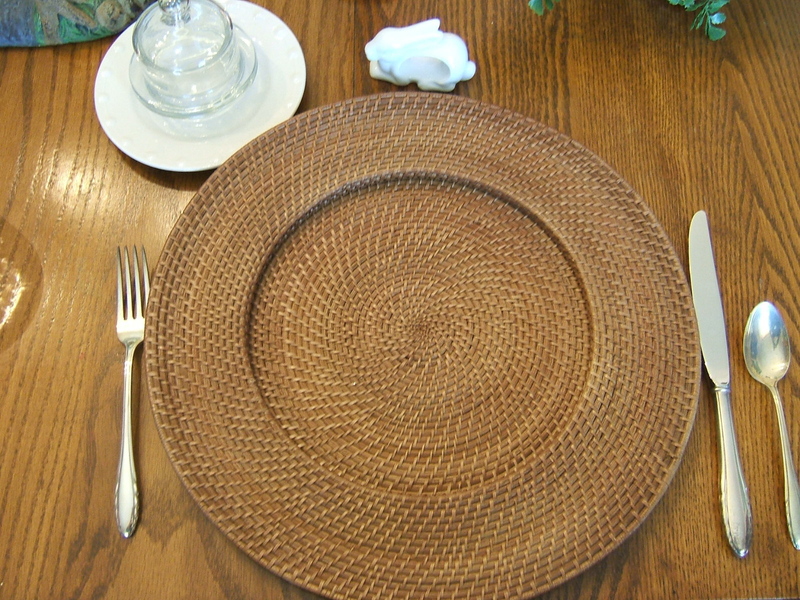 Each place setting begins with a rattan charger found at Wal-Mart this past December. I admired so many tablescapers’ rattan chargers but just wouldn’t pay the prices most stores were asking. When I ran across these for $6.97 each I knew I couldn’t pass them up. I rarely ever go to Wal-Mart so I think this purchase was meant to be. 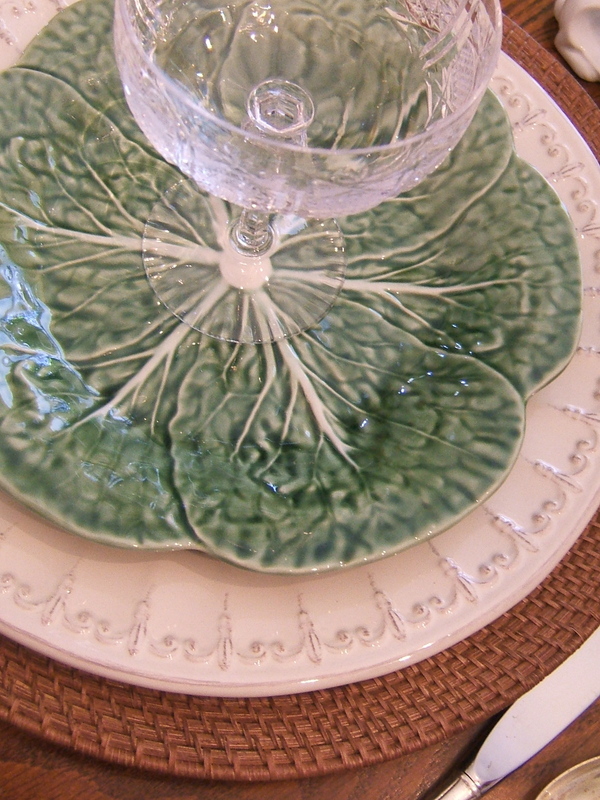 Atop the rattan charger is a white dinner plate in the Fleur design. 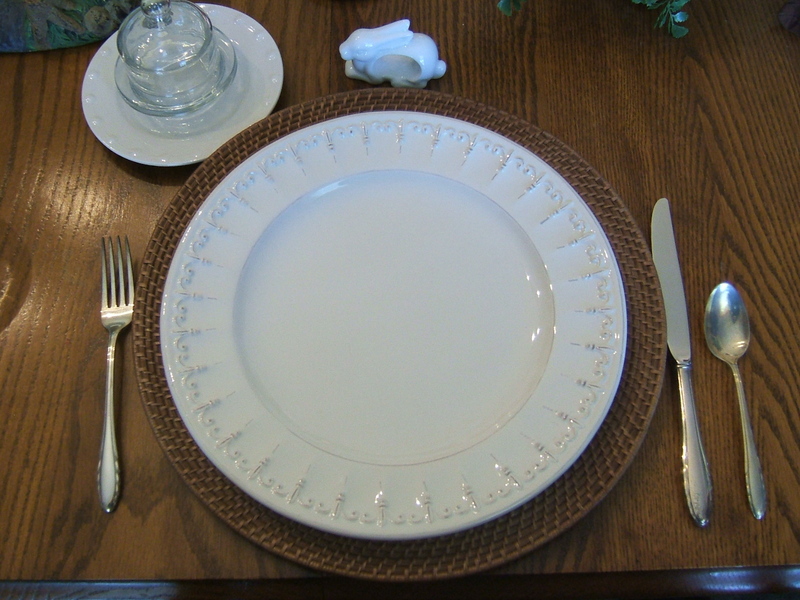 These were part of a set I picked up at Costco, paid way too much for, but just had to have because I “needed” a set of white dishes (“the little black dress of tablescaping”) and I loved the raised pattern on each of the pieces. 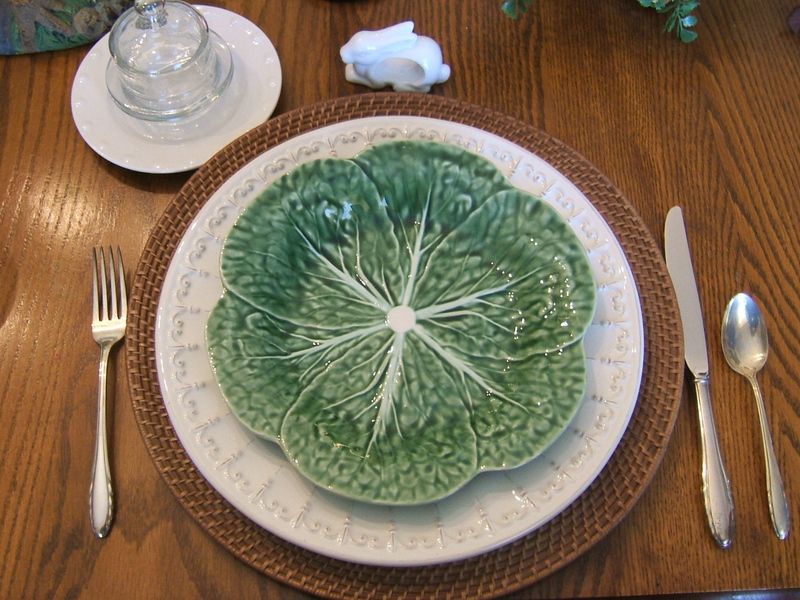 The final plate is a cabbage leaf plate by Bordallo Pinherio. These were found at Marshall’s this year for $3.99 each. I have used the cut-glass compote from my hometown yard sale adventure (go here to read about it) to top off the stack. 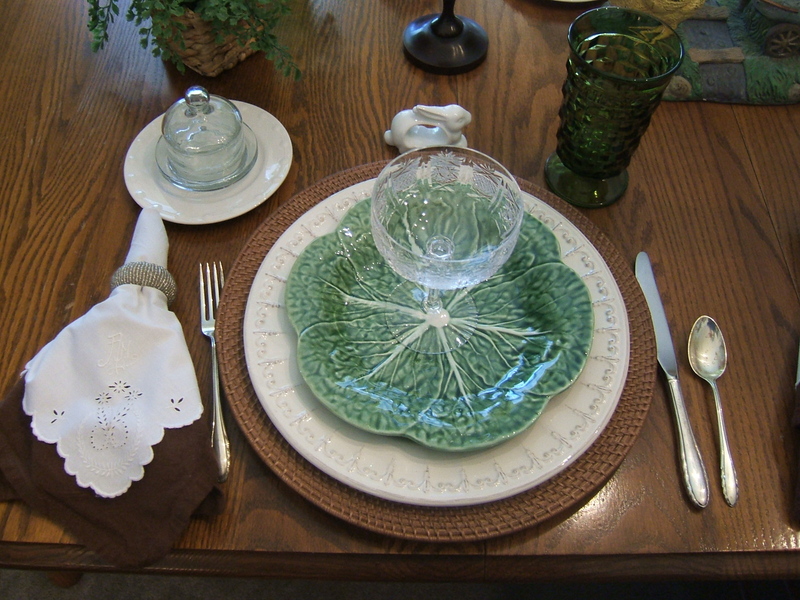 The setting also features a thrifted white plate by Oneida in the Evening Pearls design. Each of these is topped by a mini-cloche (butter dish) from the Williams Sonoma outlet. My green vintage glasses are also thrifted. They are Indiana Glass in the Whitehall design. Don’t hate me, but I paid only 75 cents for each glass. 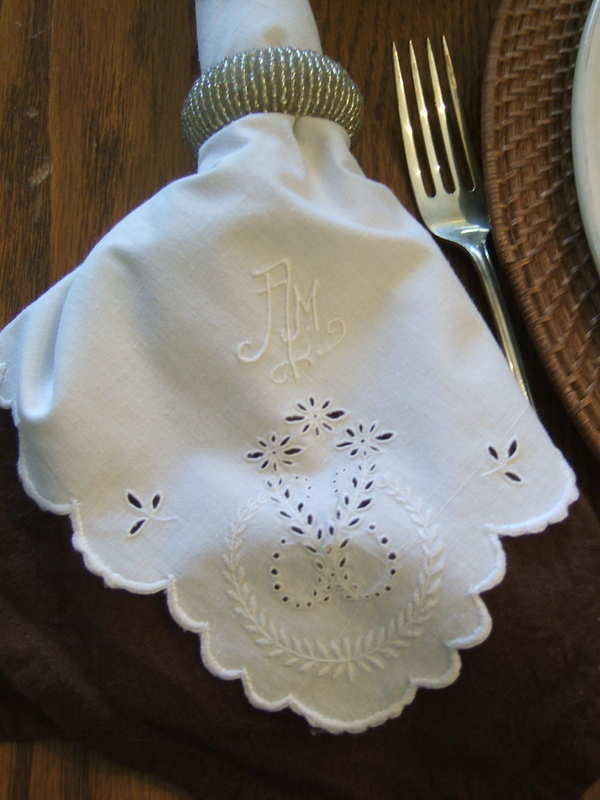 I’ve used a vintage monogramed white napkin (Ebay) over a solid brown napkin (Bed, Bath & Beyond). Finally I am using my mother’s beautiful silver, priceless. This is the Lyric pattern by Gorham. I promise I will polish and clean it before we use it. 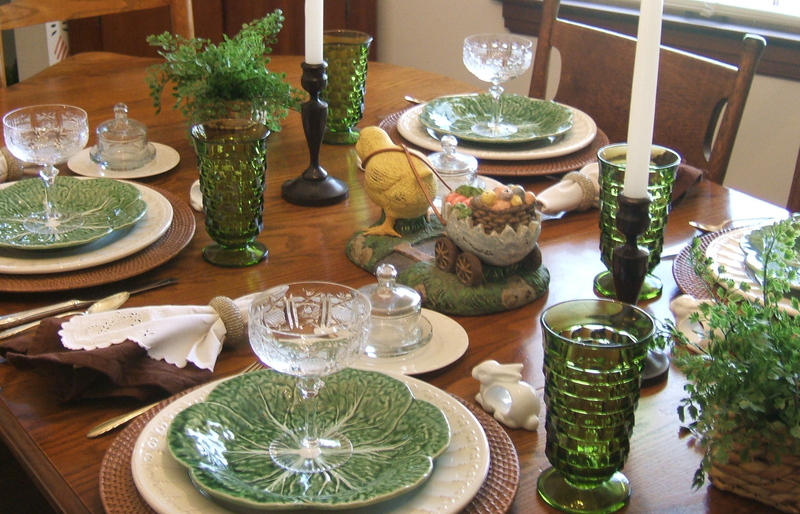 I am linking up with Susan at Between Naps on the Porch for Tablescape Thursdays. 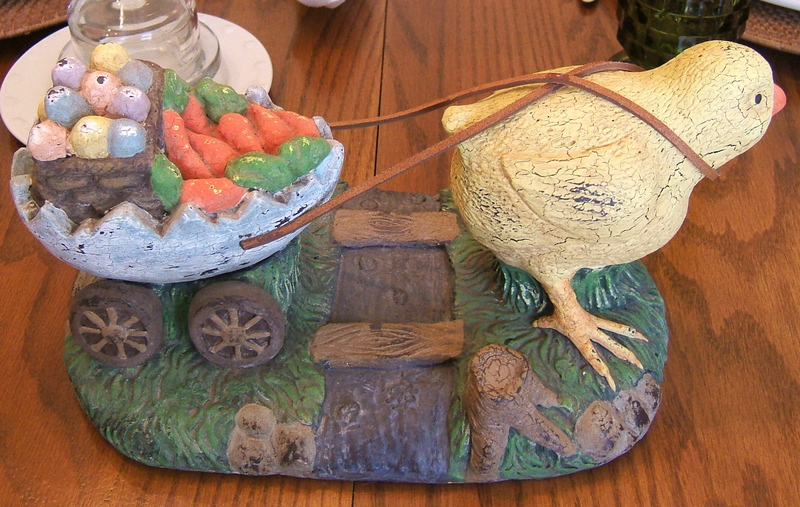 This entry was posted in Dishes, Garage Sales, Silver, Tablescaping, Thrifting, Vintage, Yard Sales. Bookmark the permalink. Just lovely! I love those napkins, so classic! Love your tablescape! I remember those green glasses. I still have a few of the juice size. Thanks for your visit today!! I’ll be back. I love your tablescape, Tammy. Everything is so pretty and fresh looking. I would have sworn that chick was very *elderly*! LOL She sure looks vintage to me! Your entire table just shows how wonderful it is to mix the old with the new. We priced Whitehall tumblers for my sister when she was here…Yikes! You really scored on those! I saw a sign recently that said “Antiques are Green”. In your case, it is doubly true! Very well done, Ms. Tammy! You are so right about needing a little black dress of tablescaping! I’m not that fond of my current white set and have been trying to choose a new pattern. This table came out wonderfully. 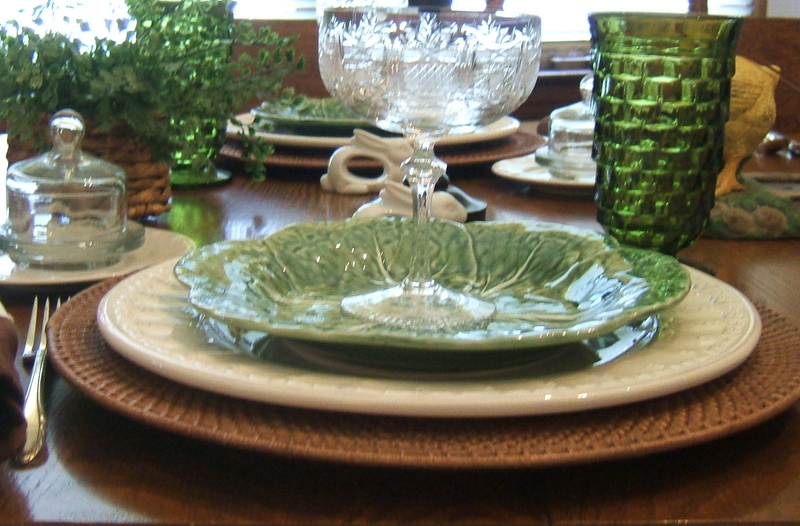 I like the cabbage dishes and the green glassware. I would love some of both. Don’t you just know that by the time I find some, it will be autumn or something. Your table is just lovely. And that vintage chick is adorable. love the cabbage plates. I still am on the look out for some while thrifting. And your glassware is wonderful. I hope you and your family have a blessed Easter! 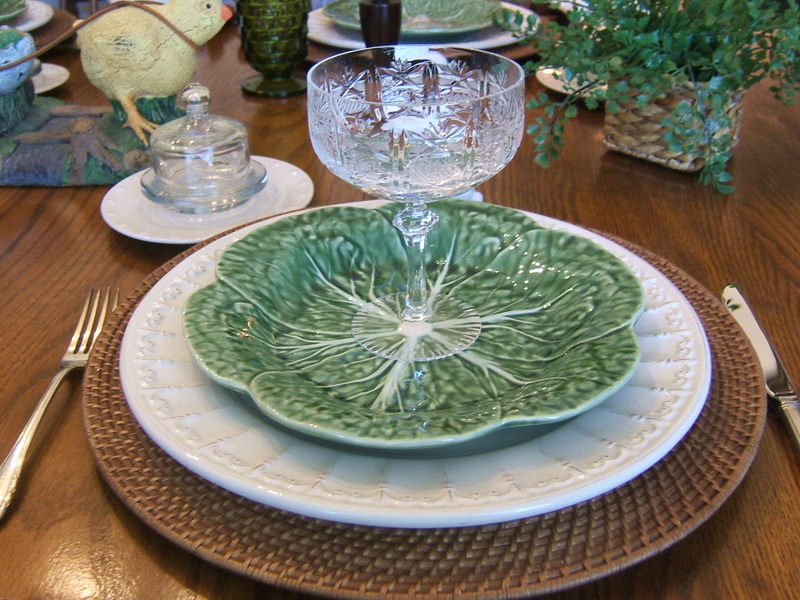 I ♥♥♥ your table…green and white are my favorites, especially when the are paired with the rattan chargers. I have been on the look for those elusive green water glasses, I have them in clear, light blue and amber…I know I will find them one day! I love those cabbage plates. I’m going to have to get some for myself. I also really like the way you have layered all the different textures of the plates and the cool chargers. 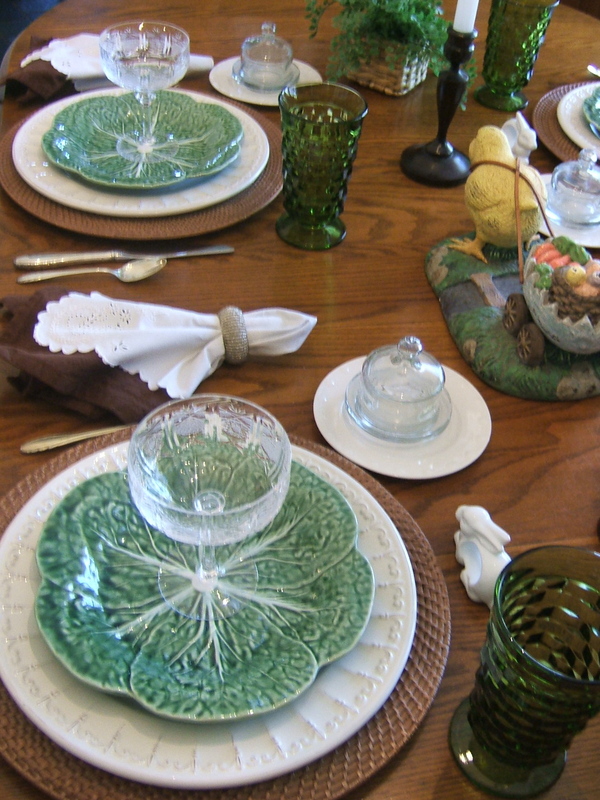 Such a pretty Easter table, Tammy! Your placesettings are lovely — such darling little mini cloches! 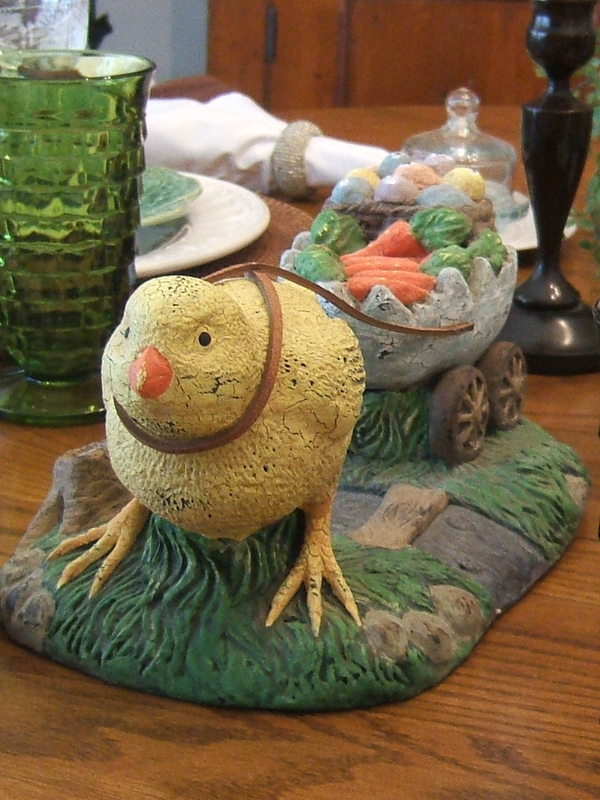 And your “not-vintage” Easter chick is adorable!